5 Minute Librarian: 21 Awesome Instagram Accounts for Reposting! 21 Awesome Instagram Accounts for Reposting! If you are participating in the Instagram Challenge, you'll see that on Day 20, we suggest that you follow bookish Instagram accounts and repost one on your account. 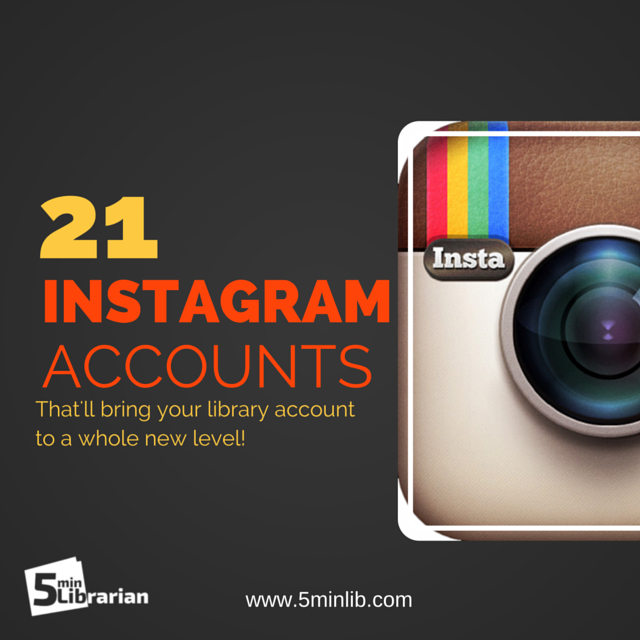 We recommend this because there just isn't enough time in the day for busy librarians to keep up with Instagram accounts. But there's good news -- we're not the only ones who love books and want to post about them. And there are many other people who have the time, the budget, the props, and the expertise to post fantastic Instagram images. Images that are perfect for libraries to repost (and, of course, tag back to the original account!). The first accounts I'd highly recommend following are publishers. They have great content from beautiful book covers (all of them are quality pictures because they want to sell the book!) to author spotlights to fun bookish quotes. Bonus -- learn about new books coming out that you can order for your collection! Book stores are also great accounts to follow. The following ones below have quality pictures and many images that libraries can repost and tag back. Bonus points when they have an author visit and take a photo of them holding onto their book! And there are some really awesome book websites (or even just unique Instagram accounts) that are fun to follow and highlight at times on your own account. Since I'm a Teen Librarian, I thought I'd share a few other YA Lit accounts that I really enjoyed. Any library can use them, too, since YA Lit is the hottest genre at the moment... Though, my opinion might be slightly biased. TheaK, thanks for sharing! I didn't even think to check out graphic novels, good suggestion!